Miskatonic University Campus • View topic - MUP 133 - Pulp Magic, Psychics, and SCIENCE! MUP 133 - Pulp Magic, Psychics, and SCIENCE! In this episode, Jon, Murph, Chad, and Dan are joined by Christopher Smith Adair to talk about Chapter 6 of Pulp Cthulhu, Pulp Magic, Psychics, and Weird SCIENCE! This episode was recorded on October 9, 2017. The Dare has funded and wrapped up. 667 backers. Over $10,400 raised. Met nearly all of its stretch goals, the last one of which I am helping with - Mythos and notable pulp writers and figures in child form as pregens. The Haunted Clubhouse is a lethal and harrowing Call of Cthulhu Role Playing adventure. Devil's Swamp funded and only has three days left (will be closed by air time). 608 backers, +$21,400 raised. For the Love Of is available for download, and has been &gt;745 times! Focus Home Interactive's Call Of Cthulhu has been delayed until 2018. "This is a fantastic podcast. I have learned so much, while being entertained at the same time. A special thanks to Jon Hook, as my first game as a keeper was with his terrific scenario "For the love of", which is free on their website. Go Pods!" 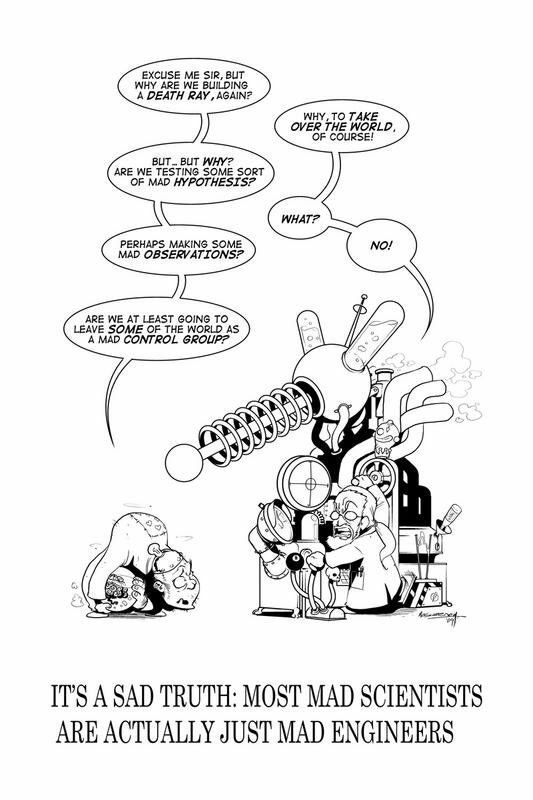 Pulp Cthulhu Chapter 6, Magic, Psychic Powers and Weird Science! 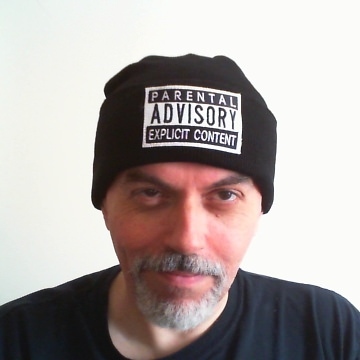 Christopher talks about his experiences using these rules in his playtests of A Cold Fire Within, the Pulp Campaign he wrote for Chaosium. 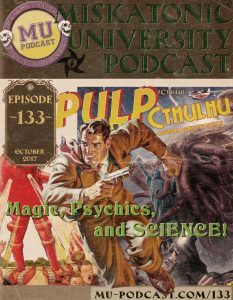 Re: MUP 133 - Pulp Magic, Psychics, and SCIENCE! I should have mentioned during the discussion of the H.P. Lovecraft Film Festival that the organizers have begun releasing compilation DVDs again, highlighting some of the best films shown at each year's festival. You can now get compilations for 2014 through 2016, along with two collections of classics from prior years: https://arkhambazaar.com/hplff-films/. Films can also be occasionally tracked down on various streaming services and elsewhere. "The Sound from the Deep," a Finnish film that won both the organizer's prize for best short of the festival and the audience choice award (apparently, a rare combination). "A research group searches for oil in the Arctic Ocean, but finds much more." It's very well done in every aspect, and the screenwriter definitely knows not only Lovecraft but related writers. "The Ningyo," a US film that came close to winning the prizes. "Professor Marlowe finds a piece of a map pointing to the way to the Ningyo, a mythical Japanese creature." This is a gentler film than most of those shown at the festival, and, like, "The Sound from the Deep," it boasts impressive production values. "Wattmarck," an Austrian film inspired by Lovecraft and early synthesizer music. It was another strong contender for audience choice. "German inventor and musician Karin Steckheim reassembles her band for a final concert." "Home Education," a strange film from the UK. "An inquisitive girl is convinced by her controlling mother that her dead dad will resurrect if they show how much they miss him." "There Is No Door," another strange one, also dealing with death, this time from the US. "From childhood to adulthood, Sam contends with a curse that has plagued her family home for generations." "Gut Punch," a buddy comedy from the US. "A rag-tag group of good-time seeking bros are invited to the party of their dreams." It was made by a group of friends who are already involved in various aspects of Hollywood, and it sounds like there's some interest from outside parties in expanding it into a feature. The creators say they definitely have more stories they want to tell. Comedic Lovecraftian films at the festival tend to be hit or miss for me, and more often miss, but this one actually worked all right for me. Last edited by csmithadair on Fri Oct 20, 2017 12:54 pm, edited 1 time in total. I am loving the One-page scenarios from Reckoning of the Dead! The pre-gens that come with them are awesome! Reminds me of DCC 0-level funnel characters. Just the necessary information to play. No need to get too deep into background -- they're going to die or go crazy anyway. I love how CSA has casually dropped that he's publishing a pulp campaign later on this year. This was the first I heard of it and am really excited! Can't wait to hear more on that. It should actually be out late next year, if all goes well. Revisions are with Mike Mason, so it's just waiting to move fully into the production queue. Mike Mason announced it, along with other upcoming books, at NecronomiCon this year. There should be more concrete information in a few months. As I hinted, my goal was to take characters deep into corners of the Lovecraftian universe we've never really gotten to explore in the game before. I hope it's worth the wait! Hi all, just a quick thank you for once again throwing some light on to The Dark Times! I am so glad that it's going down well with people, and I want to take this opportunity to thank CSA and all other previous Protodimension contributors. Next issue should be out at Yuletide so look out for that, and keep sending us material! We can't do it without you. "There is more to darkness than the sun going down."